College brings many new adventures to new students. It is where students make important life decisions and meet new people in their lives while making life connections. It is safe to say that college can be a scary while also exciting time for students. Knowing this, one aspect to consider is if college is experienced in a different way to international students? Most international students are in a completely new environment and culture from what they are used to. This can largely impact students in different ways while also providing them very important opportunities. Michigan State University (MSU) is one of the many universities where international students can study. MSU first had international students attending the college in 1873 and the students were from Canada, Holland and Japan (On the Banks of the Red Cedar). While doing research on this topic I visited the MSU Archives and Historical Collections Office. I had them pull information on international students for me so that I was able to take fieldnotes on them. As I flipped through the different articles, a lot of the titles were statements about how the international student population was increasing. There were so many different kinds of articles discussing that. The newspapers seemed to be very interesting in allowing the citizens of East Lansing to be informed about the increasing student population. There were so many articles that I could not keep track. After looking through all the articles about new international students coming to campus, I wanted to see where we stood currently. MSU currently had 7,264 international students in the fall semester of 2016 (International Studies and Programs). The amount of international student has grown by ten percent over the past five years (International Studies and Programs). The international student enrollment only seems to be growing. Since the international student population was so high, it made me think about the number of students who most likely come from different backgrounds and will then have to adapt to a new culture. My research question is, what struggles do international students face when adjusting to campus life? I reached out to three female international students from different parts of Asia. They are in different parts of their academic careers, which allows me to see how their difference of opinions based on their amount of time they have been here . Two of the students (Chelsea and Blair) are from Taiwan and one student is from China (Xiaoxuan). Chelsea and Blair are two students studying in a graduate program on campus in order to receive their masters in marketing. Xiaoxuan is from China and she is an undergraduate student studying finance through the business college on campus. Each of these participants had really interesting stories and opinions concerning how they view their campus life. By listening to their stories I have found that international students can have a difficult time participating in student organizations or clubs and that it can also be difficult to create a close friendship with domestic students. When researching this topic, I came across an article that discussed some struggles that international students faced in the United Kingdom. The article, “Encounters with racism and the international student experience” written by Lorraine Brown and Ian Jones, brings up many important issues that international students deal with o campus. In this particular study, international students discussed their encounters with racism. This article used students from a cohort made up of different nationalities and it was stated that, “Out of 153 students, 49 stated that they had experienced racism; however, it is noteworthy that fifteen students refused to be interviewed, commenting that they felt too distressed, angry or uncomfortable to talk about their painful experiences” (Brown & Jones 1008). This means that almost a third of the cohort population experienced a form of racism. When learning about this, it made me wonder about MSU. I wanted to know if some of the international students on campus face racism while being here. When I asked Chelsea, Blair ad Xiaoxuan about it, they did not have too much to say, but they had strong opinions on other topics such as on campus groups and relationships. MSU is a very big campus that has many different students with different interests. Due to this, there are over 700 student organizations on campus (Office of Admissions). Among these are clubs under the categories of academics, sports, women’s interest, etc. (Community by Simplicity). There are numerous clubs and organizations on campus that are provided for students. Although many opportunities are provided to get involved on campus because of the number of clubs offered, some international students still find it difficult get involved. Chelsea and I discussed her experience with clubs and organizations on campus. She had found it very difficult to become involved in them because the people in the clubs did not seem to be super welcoming. H: Um, have you had any negative experiences at MSU? H: haha, could (would?) you like to um expand upon a couple of them? Chelsea describes here that she tried joining several groups on campus, however, she felt as though, they may not have been very inclusive. Chelsea thought that the groups were already very friendly to each other because they already knew each other and that when a new student tried to join, it felt different. Since Chelsea is a graduate student, she thought that her age might have interfered with that. In the end, she believed that they didn’t have the want or motivation to really get to know the new members. With that said, not only did Chelsea find getting involved with on campus groups challenging, but so did Xiaoxuan. She could not find the motivation to actually get involved on campus at first. Even when she attended the famous Sparticipation event that is held on campus. H: um and so was it hard or er was it easy to find clubs to be involved in on campus? X: I mean I went to like the i-it’s not called Sparticipation before I think but it’s call Sparticipation now. H: okay um, why do you think that was? X: …um because…um because…I don’t I don’t know. Sparticipation is an event held on campus every year where most of the student clubs and organizations stand at booths, trying to get the new students to join their clubs. I have personally attended the event as a freshman and as a recruiter, so I understand the process pretty well. Xiaoxuan gave her email out to different organizations but then decided to not go to them. This might have been because she was in a new environment and was possibly nervous about it. Something kept her from continuing through with her interest, there was something that stopped her from going. When discussing the possibility of advertising the events/clubs/organizations on campus more, she seemed to think that it was a good idea. This allowed me to think that if Xiaoxuan was able to see more people joining and talking about groups on campus, then maybe it might have helped with her motivation in going to groups when she first got to campus. H: Okay okay…um do you think that maybe they should then advertise them more? X: Such as coffee hour, I really don’t have the motivation to go to coffee hour. While hearing Chelsea and Xiaoxuan talk about their experiences with on campus activities, I wanted to look back to my research and fieldnotes. I remembered from going through the archive documents that there were some documents dealing with international student organizations. 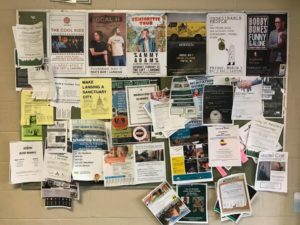 As discussed before, MSU still has many different clubs which I assumed would mean that they would be advertised all over campus. I walked through different buildings on campus, including Berkey Hall, Wells Hall, Wonders Hall in order to test this idea. (Photos taken by author). Out of most of these picture, there were only about two or three advertisements for diverse events. One of them was the North American Indigenous Student Organization (NAISO), where it gave a list of events for the spring semester. 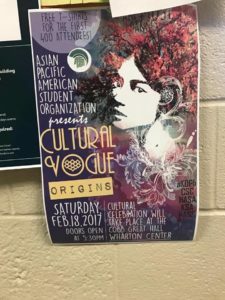 The other flyer was for the Asian Pacific American Student Organization where it was advertising their Cultural Vogue Origins event. However, a lot of the flyers had to do with tutoring and work opportunities. 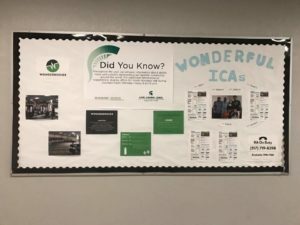 One board that I found really interesting was the Intercultural Aid (ICA) board in Wonders Hall. From my experience of being a resident on campus, the intercultural aids promote diversity and diverse events for the residents in their resident halls. I thought that it was a good idea to have that in there because it might show students who they should go see in order to seek more information. With that said, in the article “International Students in the United States Overall” written by Steven Gold, he discusses an event, Global Fest, at MSU where students stand at booths that represent their home country and they can inform individuals about their culture (Gold 524). However, even though this event is even discussed in a scholarly article, I have not heard about it during my four years on campus and have not seen any advertisements of the event. 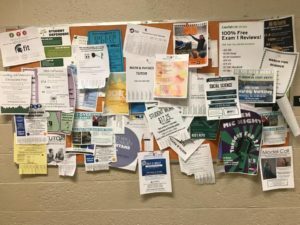 I thought that there would have been a lot more flyers around campus, given the amount of student clubs and organizations on campus. If there were more advertisements available to students, then that might be more beneficial for students who might be shy or unmotivated to go. It could help educate the students about different groups on campus. When arriving to a new university, students are bound to meet new people and create new friendships since they are in a new environment. There is this societal idea that the friends you meet in college are the ones you will always be close to for the rest of your life. Friendship in college is seen as a huge desire. It can be fun and exciting to meet new people while sharing the new college experience with them as well. However, Chelsea mentioned her experience with creating friendships in a very concerning manner. She had already mentioned to me that it was difficult to be involved on campus depending on the person running them because they may not be interested in friendship, just new club members. Chelsea also mentioned that it is hard to make friends with domestic students due to the amount of course work and that in order to make friends you might have to go to the bars around campus. She thought that cultural differences can also affect the ability to have a close friendship. For instance, she gave an example of the cultural difference of straightforwardness and how that can impact someone who did not grow up in a straightforward culture a different way than someone who did. When I asked her about having any experience with discrimination on campus, she mentioned how there wasn’t any direct discrimination, but how it was hidden. Chelsea didn’t think that there was outward discrimination to her but rather that it as this hidden sense of differences between the students. She mentioned how it can be hard to get past because it can lead to disappointment if it doesn’t work out. Knowing that there is a difference between two individuals and trying to get past that can be a difficult thing to do. After discussing this with Chelsea, I wanted to ask Blair her opinion on the difficulty of making friends with domestic students. I wanted to know if this was something that many international students struggled with or if it was more personal than that. When I asked Blair if she thought if it was easy to make domestic friends, she had a similar response. B: sometimes I feel like that Americans th-that domestic students they are more familiar with foreign cultures or something or exposed to this kind of environment and they are more willing to hang out with us. Maybe spend more time to understand the Asian community. H: Okay yeah…so do you think do you think that the students who do not take an initiative to learn about other cultures, do you think that they don’t really want to make friends with international students? In a way, this can relate to what Chelsea said in the terms that it can be difficult. However, Blair mentioned how it really depends on the person. She thought that it could be easier to make friends with some students who might be more interested in learning about different cultures versus students who don’t really want to. She mentioned that this could also be a two-way street. Some international students might not necessarily make it their only goal to make a domestic friend. This situation can go both ways and that it really just depends on the individuals involved. With that said, Xiaoxuan brought up a similar idea as well. She discussed how it can be easy to make American friends, but it can be hard to keep them due to cultural differences. This is similar to what Chelsea said in terms of cultural difference being something that might be hard to overcome when making new friends. X: …well it’s easy to make the initial contrac-contact with like people from all over the world. But, it’s hard to get close with them. X: but it’s like hard to get close by the nature. Xiaoxuan thinks that it can be easy for domestic and international student to become some sort of acquaintance, which is similar to what Blair said in terms of her thinking that a lot of the domestic students are very nice. However, Xiaoxuan believes that it might be harder to maintain a close friendship after that. When I asked her about seeing students with different ethnicities interacting on campus, she continued with the explanation that she mainly sees it happening when it is something school related. For instance, being in the business complex getting work done. Xiaoxuan didn’t seem to think that there was a lot of strong interactions on campus from students with different backgrounds. She believed that is was easy to be friendly with each other but in order to form a stronger relationship, it might be more work. Overall, international students at MSU do face some sort of difficult struggle. One is that some believe that it is hard to get involved on campus. 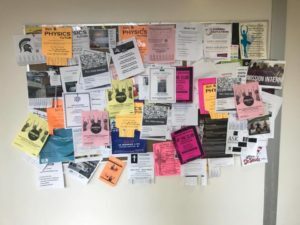 Xiaoxuan discussed how she found it hard to be motivated to go to campus organizations…however, she eventually found the will to go and join some clubs after her first year on campus. Chelsea even discussed how it seemed as though certain clubs were only interested in having members instead of building friendships in the club which was difficult for her to do. This can be seen as surprising based on all the different clubs that are offered for a lot of different interests. 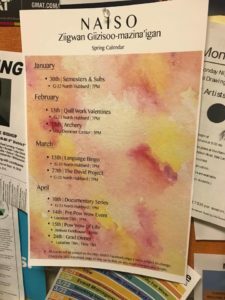 However, after going through campus and looking for advertisements about these clubs, there were limited flyers for different cultural organizations or clubs on campus. 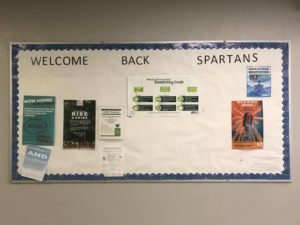 Perhaps, if there were more advertisements then it might increase the involvement of student organizations and make it easier to be motivated to go to them and make new connections through them. Another point that can be taken away from this study is that some international students might find it difficult to become close friends or find close connections with domestic students. All three of the students mentioned how this could be due to the cultural differences. One point that Blair made was that most of the students were very nice, but it can be hard to find connections. This related to what Xiaoxuan said about it being hard to become close to each other. Another point to address was that Blair mentioned that this is not every student on campus. It can be very dependent on who is talking to who. Even Chelsea mentioned this invisible line that exists in terms of differences and how it can get in the way of relationships. Since all three of these students had similar ideas on this topic, I found it to be important to include. With that said, two main findings was that some international students at MSU found it hard to become involved on campus while others also found it difficult to make close friendships with domestic students. Overall, the process of doing this ethnography was very new for me. I have never completed an ethnography before, so participating in putting one together was very different from my past anthropology course work. I found that it can be exciting, difficult, fulfilling, and rewarding. Not only are you able to give to a voice to a group of people, but you are able to learn individual’s thoughts and opinions. You are able to meet new people and be able to have personal conversations with them about interesting topics that you will always remember. The most difficult part of putting this ethnography together would be having to make connections between individuals. Sometimes when you’re talking to participants, they might have completely different thoughts or opinions on matters…which can be hard to find core themes in your research. Other than that, this process has been very educational in that I know how to work towards putting together ethnographies. I have learned so much from this project in terms of organization, ethics, and conducting research. This process has taught me so much about ethnographies and I look forward to future ethnographic experiences. Blair, face to face, February 28 2017. Brown, Lorraine and Ian Jones. 2013. “Encounters with Racism and the International Student Experience.” Studies in Higher Education 38 (7): 1004-1019. doi:http://dx.doi.org.proxy2.cl.msu.edu/10.1080/03075079.2011.614940. https://search-proquest-com.proxy2.cl.msu.edu/docview/1435359201?accountid=12598. Chelsea, face to face, February 20, 2017. Gold, Steven J. 2016. International students in the united states. Society 53 (5): 523-30. “Timeline-1873”. On the Banks of the Red Cedar. http://onthebanks.msu.edu/Timeline/1-7-4/first-international-students-enroll-in-college/. Xiaoxuan Wang, face to face, March 1, 2017.